On November 4, 1952, at 16:52 GMT, a strong earthquake off the coast of Kamchatka Peninsula, in the far east of Russia, gnerated a great destructive Pacific-wide tsunami. The tsunami waves struck the Kamchatka Peninsula, the Kuril Islands and other areas of Russia's Far East, and caused considerable damage and loss of life. The tsunami caused severe damage along the Pacific coastal area of the Kamchatka Peninsula, and was also very damaging in the Hawaiian Islands. There was also some damage in Peru and Chile. Although the tsunami was widely observed and recorded in Japan, there was no loss of life or any significant damage there. The Kamchatka Peninsula is the site of shallow subduction of the Hawaii-Emperor seamount chain, one of world's longest (6000 km) hotspot chains. 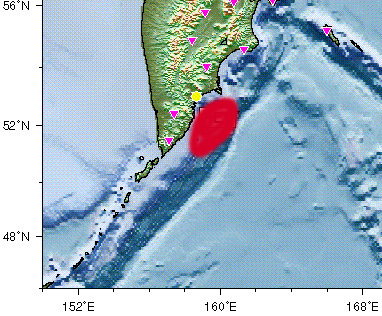 The geologic and geophysical data that has been collected over the years for this region of the Kamchatka Peninsula indicates that shallow plate subduction and/or accretion of seamounts may be responsible for several of the regional tectonic effects, including the formation or a double Neogene volcanic arc separated by an intra-arc basin. Geochemical, structural and stratigraphic data shows the presence of alkaline volcanic rocks in the outer volcanic arc and an active forearc indentation of the Pacific margin of Kamchatka, associated with constriction and shoaling of the Kamchatka trench, and uplift of marine forearc basins of Neogene age. Shallow subduction and accretion of seamounts is particularly evident in the forearc region of the Kronotskiy Peninsula - the Pacific promontory near which the Hawaii-Emperor seamount hotspot chain terminates. The November 4, 1952 earthquake occurred in this general area. The highest and most destructive waves from this tsunami were observed and experienced in the Kamchatka Peninsula, the Kuril Islands and other areas of Russia's Far East. There was considerable damage and loss of life in these areas. The 2nd and 3rd waves were the highest. At Alaid Island run up was 1.5 meters, at Shumshu Island it ranged from 7-9 meters. At Paramushir Island the waves ranged from 4-18.4 meters. At Severo - Kurilsk on Paramushir Island the second wave was the highest reaching maximum run up of 15 meters. It destroyed most of the town and caused considerable loss of life. At Onekotan Island tsunami run up was 9 meters, while at Shiashkoton Island 8 meters and at Iturup Island 2.5 meters. Komandorsk Islands and at Okhotsk - Magadan waves of up to 2 meters were observed. At Sakhalin - At Korsakov a 1 meter wave was observed. The tsunami was widely observed and recorded in Japan but there was no loss of life or damage. The following are locations in Japan where the tsunami was observed or recorded. The height is given in meters. Travel times ranged from 1.8 hours at Kushiro to 4.6 hours at Kii- Kushimoto. The Hawaiian Islands experienced larger waves than most places outside the generating area. The tsunami caused damage on Midway Island. Elsewhere in the Hawaiian island chain, the tsunami waves were destructive in certain locations but hardly noticeable at others. In some locations, the waves destroyed boats and piers, knocked down telephone lines, and caused extensive beach erosion. Fortunately, no human lives were lost in Hawaii from this tsunami, but damage was extensive, estimates ranging from $800,000- $1,000,000 (in1952 dollars). Kauai - There was damage on the north shore of the island but it was not significant. Oahu -The north shore of Oahu experienced higher waves of up to 4.5 meters. The Honolulu tide gauge recorded only .7 meter wave. However as the photo below indicates, actual tsunami run up was higher. The tsunami was powerful enough to throw a cement barge in the Honolulu Harbor into a freighter. Tsunami Travel Time to Honolulu was 6.3 hours.Periods of waves averaged 38 minutes. 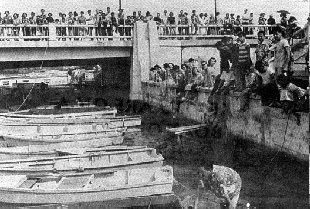 Photo of people gathered at the Ala Wai Boat Harbor in Honolulu watching the withdrawal of the water that left boats sitting on harbor mud - An example of very foolish thing to do during a tsunami. These people should have been evacuated long before the arrival of the tsunami. Hawaii - The island of Hawaii experienced run up to 6.1 meters. Coconut Island, Hilo Bay: Run up at Hilo was 3.7 meters. A small bridge connecting Coconut Island to the shore was destroyed by one of the tsunami waves lifting it off its foundation, then smashing it down. Tsunami Travel Time to Hilo was 6.6 hours. 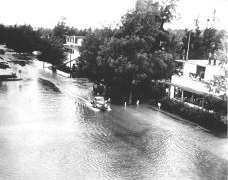 Damage at Hilo was estimated at $ 0.4 million (1952 dollars). By far the largest waves outside the generating area were observed in the Hawaiian Islands. Fortunately, no human lives were lost in Hawaii from this tsunami, but damage was extensive, estimates ranging from $800,000- $1,000,000 (in 1952 dollars). The tsunami caused damage on Midway Island. Elsewhere in the Hawaiian island chain, the waves destroyed boats and piers, knocked down telephone lines, and caused extensive beach erosion. In some locations, tsunami waves were destructive in certain locations but hardly noticeable at others. The north shore of Oahu experienced higher waves of up to 4.5 meters. On the south shore of the island, the tsunami was powerful enough to throw a cement barge in the Honolulu Harbor into a freighter. The island of Hawaii experienced run up to 6.1 meters. A small bridge connecting Coconut Island to the shore was destroyed by one of the tsunami waves lifting it off its foundation, then smashing it down. The tsunami was recorded or observed throughout the islands of the Pacific, in New Zealand (1m), in Alaska and the Aleutian Islands and in California where waves of up to 1.4 meters were observed or recorded. Pararas-Carayannis, George. Catalog of Tsunamis in the Hawaiian Islands. World Data Center A- Tsunami U.S. Dept. of Commerce Environmental Science Service Administration Coast and Geodetic Survey, May 1969. Pararas-Carayannis, George and Calebaugh P.J., Catalog of Tsunamis in Hawaii, Revised and Updated , World Data Center A for Solid Earth Geophysics, NOAA, 78 p., March 1977. IIDA, K., D.C. Cox, and G. Pararas-Carayannis, 1967b. Bibliography to the Preliminary Catalog of Tsunamis Occurring in the Pacific Ocean, Hawaii Inst. Geophys. Data Rpt. 6, HIG-67-25, Univ. of Hawaii, 27 pp. Anon. , 1952b.Tsunami of March 3, 1952 in Hawaii, Volcano Letter , Hawaiian Volc. Obs., No. 515, p. 7. Anon., 1953. Investigation of mareograms of tsunami accompanying Kamchatka earthquake, Quart. J. Seismol., v. 18, no. 1, p. 38-39. Anon., 1954a. Seismological notes, Bull. Seismol. Soc. Am., v. 44, no. 1, p. 86. Anon., 1954b. Outline of Earthquake Disasters in and near Japan, v. 1, 1886-1912, [Japanese], Earth. Information Group, Seismol. Section, Central Meteorol. Obs. Berninghausen, W.H., 1962. Tsunamis reported from the west coast of South America,1562-1960, Bull. Seismol. Soc. Am., v. 52, no. 4, p. 915-921. Cox, D. C., and J. F. Mink, 1963. The tsunami of 23 May 1960 in the Hawaiian Islands, Bull. Seismol. Soc. Am., vol. 53, no. 6, p. 1191-1209. Hatori, T., 1963a. On the tsunamis along the island of Hawaii, Bull. Earthq. Res. Inst., v. 41, p. 49-59. Hatori, T., 1963b. Directivity of Tsunamis, Bull. Earth. . Res. Inst., v. 41, p. 61-81. Iida, K., 1963a. A relation of earthquake energy to tsunami energy and the estimation of the vertical displacement in a tsunami source, J. Earth, Sci., v. 2, no. 1, p. 49-67. Iida, K., D.C. Cox, and Pararas-Carayannis, George. Bibliography to the Preliminary Catalog of Tsunamis Occurring in the Pacific Ocean. Data Report No. 6. Honolulu: Hawaii Inst. Geophys., Dec 1967. Keys, J. G., 1957. History of Tsunamis in Samoa, Apia Obs ., Samoa, 6 pp. Macdonald , G. A. and C. K.Wentworth, 1954. The tsunami of Nov. 4, 1952 on the island of Hawaii, Bull. Seismol. Soc. Am., v. 44, no. 3, p. 463-469. Murphy L.,and W. Cloud, 1954. U. S. Earthquakes, 1952, U. S. Dept. of Comm., Coast & Geod. Survey, Washington, D. C., Ser. 773, p. 1-112. Sviatlovsky, A.E.M1957. Tsunamis--destructive waves originating with underwater earthquakes in seas and oceans [Russian], Izdatel'stvo Akad. Nauk SSSR, p. 1-69, Eng. transl. by V. Stevenson, Hawaii Inst. Geophys., Transl. Ser. 8, 1961. Solov'ev, S.L. and M. D. Ferchev, 1961. Summary of data on tsunamis in the USSR [Russian], Bull. Counc. Seismol., v. 9, p. 1-37, Eng. transl. by W. G. Van Campen, Hawaii Inst. Geophys., Transl. Ser. 9, 1961. Watanabe, H.M 1956. Studies on the tsunamis on the Pacific Coast of Northern Japan, Geophys. flag., Tokyo v. 27, no. 1, p. 61-75. Zerbe, W. B., 1953. The tsunami of Nov. 4, 1952, as recorded at tide stations, U. S. Dept. of Comm., Coast & Geod. Survey, Washington, D. C., Spec. Publ. 300, 62 pp.